Two British journalists collaborate on an exposé of Labour Party Prime Minister Tony Blair and his wife, Cherie Booth—without the cooperation of either subject. Beckett (biographer of Clement Attlee and Aneurin Bevan) teams with Guardian investigative journalist Hencke in an attempt to demonstrate that Blair and Booth are poseurs and liars who have used their political power wisely from time to time but should not be trusted by any voter anywhere in the UK. An in-depth biography of a sitting prime minister is by definition timely; the timeliness is only enhanced by the alliance that has developed between Blair and US President George W. Bush. Both men proclaim themselves devout Christians who are guided by their religious faith. Although something of a rebel through his university years, Blair, born in 1953, began to kowtow to Labour Party kingmakers, big-business political donors, and celebrities during his unlikely rise to the prime ministership, which he achieved in 1997. Engaged to Booth in 1977 and married to her in 1980, Blair relied on her wiliness and savvy in many of the ways that Bill Clinton relied on wife Hillary; it is probably no coincidence that Blair and Booth, Bill and Hillary, are all lawyers. Especially fascinating to celebrity worshippers among American readers will be the chapters on the relationship of Blair and Booth with Princess Diana before her death. 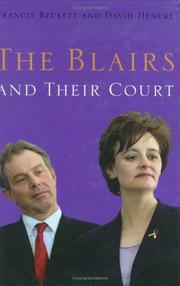 Blair’s popularity during his first year as prime minister shot up astronomically, simply because he seemed sympathetic to Diana and her loved ones after the fatal accident, at least when contrasted with the iciness of her former husband, Prince Charles, and the remainder of the Royal family. Although the authors reveal little new about how Blair came to back Bush’s invasion of Iraq after Sept. 11, 2001, the account is filled with compelling details and told with verve. It is also, however, so unrelentingly negative about Blair, Booth, and many of their cohorts as to become exhausting and exhaustive.